What better music than Vivaldi’s ‘Le Quattro Stagioni’ to start the celebration of Rachel Podger’s 50th birthday year! Together with the star players of Brecon Baroque, Rachel guides you through the seasons of nature and life. Producer Jonathan Freeman-Attwood: ‘The irresistible characterpieces that pit solo violin against string ensemble in Vivaldi’s “Le Quattro Stagioni” have reached the ears of millions over the last few generations. Most recordings adopt a strikingly similar approach to the scores, and familiarity has blunted the music’s edge: we have passed the point of rediscovery and have stopped listening intently to the freshness of Vivaldi’s invention. 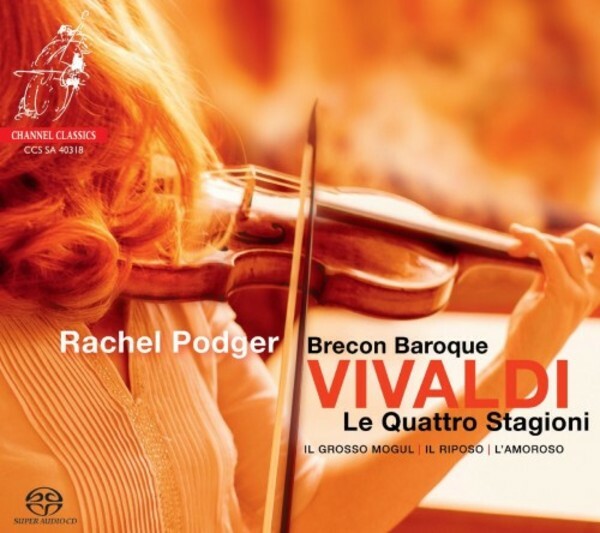 ‘Working with Rachel Podger and Brecon Baroque has been an object lesson in starting anew and identifying the ingredients which make “Le Quattro Stagioni” great works. Virtuosity is non-negotiable here and Rachel has it in abundance. But it’s the colour, poetry, vibrancy and evocative characterisation of weather, human warmth and fragility, captured by the dynamic flux of Rachel interlocking with her colleagues in Brecon Baroque, that deliver near-unimaginable qualities in this music.